We woke up yesterday and looked up towards Signal Hill and noticed a strange new cross looking item plastered to the side of the hill. We knew it was new and knew it must not have been there long and wondered what it was. The sun was out and as soon as we finished out yummy breakfast, we headed out on the hill to check it out. Given the location of our quest, we took a new route up to get to it and I was tickled to realize that after 600 or so ascents of Signal Hill, there was a new route to put together from bottom to top (I’d been on all the parts/trails we used-just never used them together to get from the bottom to top). 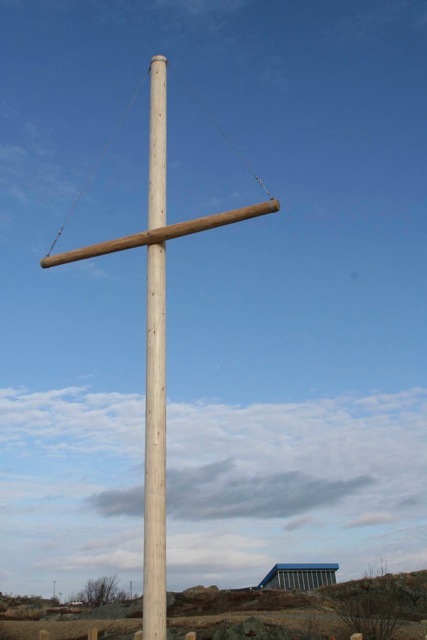 When we arrived at the “cross”, it seems like it might be a new lookout or outdoor drama space and it’s more of a ship’s mast than cross. It was different looking down on the city from that angle and location (just across from the Geo Centre-in the background with the blue roof). Anyone know what’s it supposed to be? We continued up the hill to the Queen’s Battery and enjoyed some photography and views from there. It’s always good to look at a place (and ourselves) from new and different vantage points. 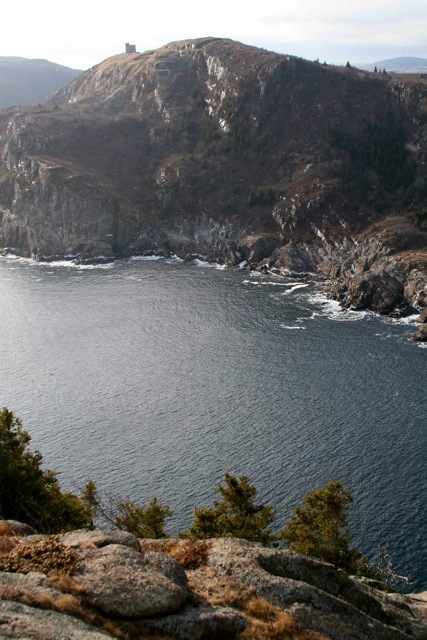 We headed down the backside of Signal Hill and then decided to do a “winter ascent” of Cuckhold Head. There’s no snow at the moment but the main ascent gully is full of a decent bit of ice so we climbed the steep section out of the gully on the left. 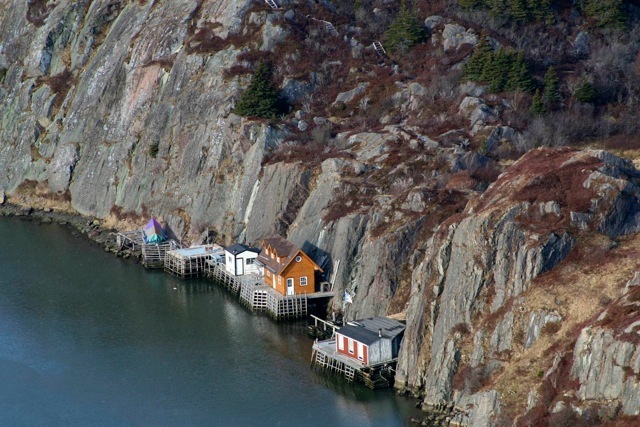 We looked down on Quidi Vidi and some of the new fishing stages. 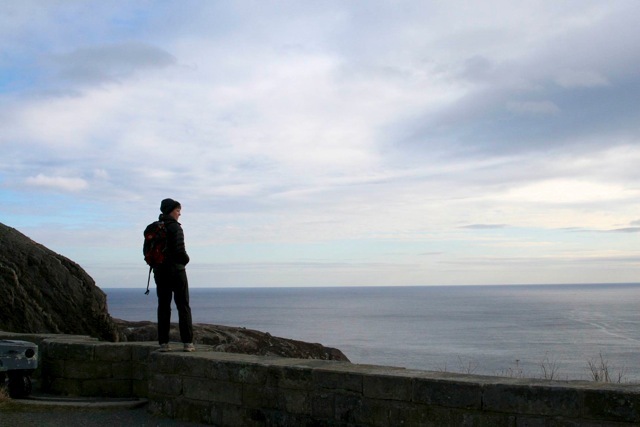 From Cuckhold Head, you get a very different look at Signal Hill and Cabot Tower. An eagle flew over our heads while we looked about and I swear, 2012 will be the year I finally get it together to camp on top of Cuckhold Head. 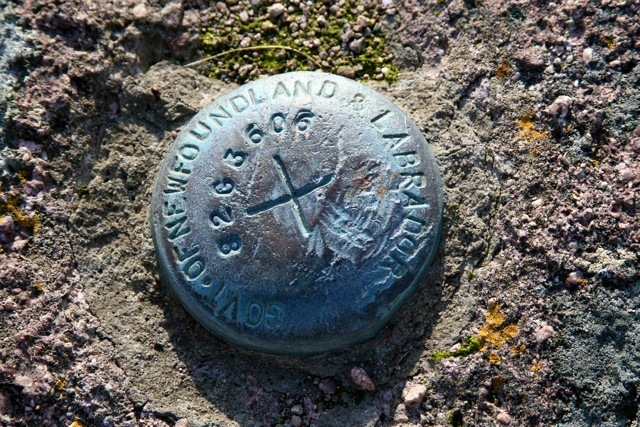 I found this benchmark on top of Cuckhold Head. They are placed by surveyors and it’s the first one I’ve found in the province. I was amazed that with the number of times I’ve been to the top of Cuckhold Head, I hadn’t spotted it. I appreciated that there was lots of new things to see if I truly open up my eyes to look. Every moment is indeed new and though I may have walked a certain way before, each time can be fresh and new. And that’s how I’m hoping to unfold 2012…with fresh and new eyes, thinking and moving. 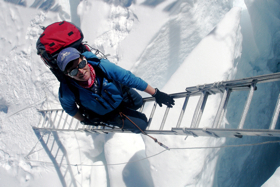 This entry was posted in Everest 3.0, Life, Newfoundland, Photography and tagged 2012, climb, Newfoundland, Seven Summits, Signal Hill, St. John's, train. Bookmark the permalink. Enjoyed this entry. Yes, every time we open our eyes we are able to discover new things in a new way if we truly try and open ourselves up to the experience. This province is amazing! Moved here in the summer and am having SO much fun exploring. Signal Hill was an instant favourite, though! I have only recently noticed what I thought was a ‘cross’ surrounded by a fence on Signal Hill and was also wondering what it was. In this picture, I agree, it looks more like a ship’s mast. Would love to know the background of who put it there and what it symolizes?? Anyone?? I haven’t yet heard the story about the Hill’s latest adornment and what it is about…you’ve reminded me of my own curiosity about it.